Just because your team got second place at Chili’s trivia one Wednesday night doesn’t mean you know everything about everything. After all, did you know that “The Bean” in Millennium Park is actually named "Cloud Gate"?! Chyea, thought so-- oh you did know that? 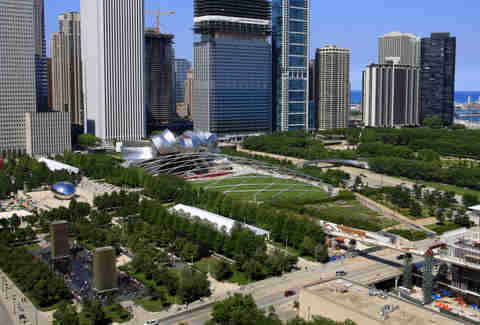 Well, Smartypants McSmartypants, here are a few facts that you definitely do not know about Millennium Park, all of which your relatives will find quite fascinating when you’re inevitably serving as their tour guide Downtown. As you can probably tell, the bean is made out of metal, which is a magical substance that expands and contracts as it heats and cools throughout the year. Inside, “The Bean” actually looks more like an old pirate ship, containing a wooden frame and beams that help support the 110-ton structure as it shrinks and expands. At one point during construction, there was also an architect’s desk and workspace set up in there (not bad for an office, eh?). 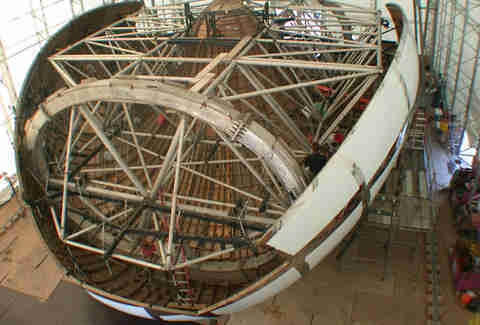 The exterior has been welded shut and polished to be seamless, and terms state that the 168-piece structure remain standing until 3006. Whatever junk is left behind inside will just have to serve as a time capsule for our alien overlords. When the Pritzker Pavilion was built in 2004, the audio setup was the crème de la crème of sound systems, and it still packs a serious punch to this day. In fact, sound is actually transmitted through the system faster than it travels through the air, so you’d actually hear the music sooner if you're sitting in the back of the lawn near a speaker versus waiting for it to come off the stage. The bandshell’s trellis, from which the speakers hang, also scares off geese, so visitors don’t have to deal with poop problems throughout the year. Before construction started, the space currently occupied by the park was basically a series of railroad tracks, like the ones you can still see adjacent to the Art Institute. The Millennium Station train depot is still there, along with a subterranean parking garage that’s equipped with 4,000 parking spaces, and the Harris Theater, which has about 1,500 seats -- all of which are located beneath the park. The park itself rests atop 4ft of topsoil, as well as several feet of Styrofoam fill that helps reduce the overall weight of the “rooftop” structure. 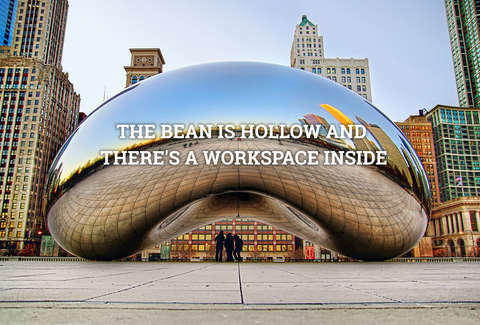 Case in point: when Kapoor was notified by a Sun-Times reporter that locals were calling the piece “The Bean,” he responded that the nickname was “completely stupid.” Kapoor also wanted to originally put "Cloud Gate" in Lurie Garden, but park planners were concerned that the foot traffic would disrupt the garden. Aside from "Bean" drama, when architect Jaume Plensa designed "Crown Fountain" (aka the waterfall with the faces), he envisioned it as a place of quiet reflection. Uhhh, sorry Mr. Plensa, but you’ve pretty much built a water park that’s filled with screaming kids all summer. Located in the northwest corner of the park, Wrigley Plaza consists of a grass lawn and a peristyle of Doric-style columns that stand nearly 40ft tall. The peristyle is also a replica of one that stood in the same spot from 1917 to 1953, which is kind of cool. But what’s really cool is that you can rent out certain parts of the park for private events. 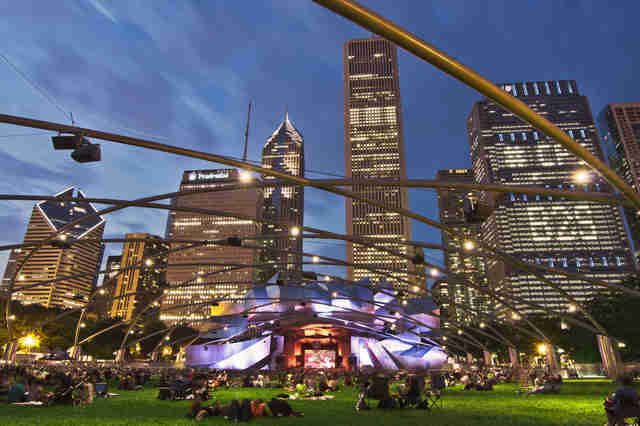 And while the entire Pritzker Pavilion (with lawn, stage, and choral-rehearsal room) costs $40,000 to book (and $15,000 in additional fees), Wrigley Plaza can be had for up to three hours at $250 an hour. Piñata party, anyone? 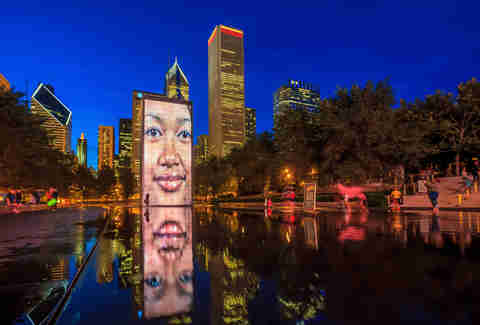 Jaume Plensa’s "Crown Fountain" features the faces of a cross-section of Chicagoans who were filmed close-up in 2003-04 by Spanish artist Jaume Plensa while they sat back in a dentist chair. The idea for the faces was actually inspired by gargoyles, which we’re not sure to take as a big diss or not. However, if you look closely, you’ll notice that the towers are actually giant LCD screens made up of a big grid of small red, blue, and green lights that brighten and dim to project the correct images. We're not talking about lathering up under a "Crown Fountain" waterfall. Located in the northeast corner of the park, the McDonald’s Cycle Center is a handy little spot that offers bike rentals, bike education, and guided tours. There are also on-site showers and lockers that can be rented, so you can get a good sweat going during your morning ride to work, and still walk into the office looking as fresh as Puff Daddy wearing a suit made of daisies. Raf Miastkowski once worked at Millennium Park and can tell you about the phantom that still haunts it to this day. Follow him @RafFoSho.